We arranged to meet on Sunday 21st February at one o'clock at the George in Castle Cary. It was a freezing cold day and Annunziata had spent the morning canvassing. She arrived on her own and we were given the use of a small sitting room which we had to ourselves and I suggested we explore her education, experience and values and see how they related to some policies. Soon to be 31 Annunziata is young to be standing for Parliament, but this is her third election foray. Her first was when she went to work for a month in 2001 for her brother when he stood unsuccessfully as the Conservative candidate for the Wrekin in Shropshire. Annunziata however "absolutely loved" the experience and in 2005 she stood in the safe Labour seat of Aberavon in Wales. Here she came fourth increasing the small Conservative vote by 968 to 3,064. She found this a valuable experience and resolved to put herself forward for selection again, hence her current campaign. Annunziata's background cannot be ignored. She comes from a grand old Somerset family and her father is the former Editor of the Times, Lord William Rees-Mogg. This obviously gives her a certain cache and makes her instantly recognisable in business, media and political circles and must have opened doors for her. The Rees-Mogg family home is in Mells outside Frome and she and her parents divide their time between there and London. Annunziata's final four years of schooling was in London at Godolphin and Latymer. This is an academic independent day school for girls. She says that school "was not my favourite place to be, but it was a good school". There she took A levels in History, Chemistry and Economics, "a very odd mix!" She was not well during her final year and had to be out of school for four months and this affected her results, but she says she had decided a full year before finishing that she did not want to go on to university - so that was the end of her formal education. She then described in detail and with some enjoyment how over the next couple of years she set about trying out a series of different career scenarios in London. Her first job was behind the bar in a pub, followed not entirely surprisingly by work experience at The Times. At the end of this they offered to keep her on, but she had already arranged an internship with an investment company in Hong Kong where she went for three months and "had a fantastic time and learned a huge amount." She also showed initiative and independence when she wrote a report on the state of the local retail market in which she contradicted the judgements of the established analysts by concluding that many leading retailers could fail. She based this on what she saw getting out of the office and actually visiting a good number of shops. Her predictions proved right. She was then offered a permanent post in Hong Kong, but at nineteen felt she needed to return home and the Times. This time she was paid and put to work on the Times Diary, but she only stayed six months. She then went for a job in an Investment company where she worked for eighteen months "in what was an extraordinary heady time" where she was involved "in trading shares and reading balance sheets" and which ended suddenly with the collapse of the dot com bubble and she found herself jobless. She had however developed a range of skills in the process. She then went through several not too happy experiences that taught her that fashion journalism and public relations were not for her. By now it was time to get serious and she was able to get a job with Sunday Business which became The Business and was owned by the Barclay brothers. It was a weekly broadsheet about business and finance. Soon after she joined the staff Andrew Neill was appointed Editor. "He was the most fantastic teacher any journalist could hope to have. He is incredibly rude, terribly blunt and a very good journalist." Annunziata started as his editorial assistant and ended up responsible for covering a group of sectors which included "the rag trade and confectionary" and she tells of the freebies provided at the Cadbury's AGM. "You were given a shopping basket and there was a fake sweet store and you simply filled it up with whatever you wanted. Made me the most popular person in our office." Soon after that there was a fall in the paper's sales and again she was looking for a job. She had worked there for eighteen months and again had extended her skills and experience considerably. This was recognised when she landed the job as Editor of the European Journal. This small monthly is the mouthpiece of the Conservative MP Bill Cash's think tank - the European Foundation. Bill Cash is extremely critical of the European Union, the Euro, the Maastricht Treaty and the newly adopted Lisbon Treaty and these are all views Annunziata came to share. As she said: "I don't think Britain can survive under this constitution. Despite being called a treaty it is a constitution and it takes powers from every single government department and gives them to what even the German Constitutional Court calls, an undemocratic system, and that I think also goes for the European Parliament. I also do not think you can have such a thing as democracy unless you have a demos and I do not think there is such a thing as a European people." She believes if we are not able to renegotiate a lot of the EU's powers, we will need a referendum. "We need a clean sweep and a proper debate." She also favours that we withdraw from the Human Rights Act which she claims is written to be in line with European legal systems rather than British Common Law. She also wishes to see us not being bound by the Social Chapter which sets out common standards for employment and cannot see why the EU should be able to regulate aspects of the building of roads in the UK. After three years at the Journal she felt she was getting a little stale and she applied and got a post at Money Week. In essence like The Week it carries a collection of stories digested from other leading papers on business and the economy. Unlike The Week it also contains a good number of stories written by its staff. During her time there she wrote 102 articles. "It was an extremely interesting place to be - meeting and interviewing an awful lot of the people who are involved in and knowledgeable about the workings of our economy and the City of London." But she was also writing about world gold prices, oil prices and silver, recommending investment in these commodities at a time when doing so she says was unfashionable. She also notes, "Several times I wrote about Gordon Brown's borrowing which I thought was out of control. He had also clearly been encouraging banks to lend irresponsibly and because there was no direction from government it seemed implicit to me that the government was encouraging people to borrow irresponsibly. After the first two years when he stuck to Conservative figures he went on a spending spree for which he did not have the money and borrowed and borrowed, making our present problems much worse." While at Money Week she gained further editorial experience standing in when the editor was on maternity leave. Finally she told me how completely surprised she was to be approached by the Telegraph to work as a leader writer, a job she did for eighteen months until she resigned after she was chosen to stand as the prospective Conservative candidate for Somerton and Frome in 2007. She felt she could not combine work on a London newspaper with getting to know the constituency and effective campaigning. All this adds up to an unusual story which is not quite the one party hand-outs and other articles tell. This is that here is someone who had what must have felt like a disappointing end to her school career and who finished her formal education with no degree or further training. Instead after taking some first steps in employment which may have been helped by the fact that it was known whose daughter she was, she went on to carve out for herself a career in the extremely demanding, specialised and competitive world of financial journalism. This seems to show real determination, intelligence and a capacity for hard work. Annunziata declares that her politics are driven by her values which she summarises as "Freedom, Opportunity and Democracy." Towards the end of our interview she declared, "In wanting to go into politics I have based everything on my core principles and I think that creates a consistency that we often see lacking in our representatives. I don't look at each issue in isolation, but as part of a larger set of values – beliefs – whatever - which come down to freedom, opportunity, democracy." She went on to say that things are never quite that simple, but she finds keeping them in mind useful. The question I posed was what do they mean in relation to policy - for pretty well everyone in whatever party would agree with them. Her response was, "It seems to me Labour does not believe in freedom, but in central control." Freedom she went on to say "means freedom to spend your own money and make your own mistakes, so that also means lower taxation." She fears we are walking into a surveillance state with less and less individual freedom. I raised the question of CRB (Criminal Records Bureau) checking. She dubbed the system we have as "A knee-jerk reaction to the appalling tragedy of the Soham Murders case, but one which would not have helped if it had been in place then, or would it have prevented the horrendous Plymouth case." 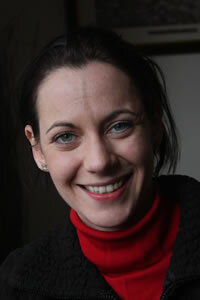 She saw the new CRB regime as something that is going to have disastrous consequences on communities because it will "destroy the interconnectedness between generations which is so important for young people" and came up with a string of examples she has come across which have had a damaging effect on the working of the community. It was not of course that she is against checks for those who regularly work with children, but when it came to school governors, football coaches, amateur dramatic societies having children in their productions, parents giving lifts etc, it has gone too far, and she was appalled to see that the new body would store on its computers gossip and unsubstantiated rumour. She sees that as a dangerous erosion of civil liberties. This lead on to a discussion of prisons and the law. It was good to hear that she has been looking at the Community Justice panels which are pioneering Restorative Justice in Somerset. Pilot schemes have dramatically reduced re-offending, particularly for young offenders. It uses a community based approach which can include victims confronting the offender and offenders coming to experience real remorse and an opportunity to make some reparation. This is very different from the build more prisons and hand down longer sentences approach. Annunziata however, while agreeing that our 80,000 plus prison population and high re-offending rate shows "something has gone horribly wrong and that we should not follow America's example", still said she supported the Conservative policy of building an extra 5,000 prison places over and above what Labour has in mind. Talk then turned to the economy. Having criticised Gordon Brown for being profligate I wondered what she thought about PFI initiatives (Public Private Finance Initiatives) to fund the building of hospitals and schools, a system which is likely to saddle local authorities with huge debts to the private sector, just when spending is getting tight. Her reply was that this was unfortunate, but the problem was not the PFI principle, but that many of the contracts "were terribly badly written. That is the key, but PFI is a good thing to do – if you have a good contract. It is quite simple. If we don't use PFI nothing will get built at all because now there is no money for schools and hospitals." She also stressed that "if we don't have a serious plan to cut back on spending no foreign banks will lend to us on current interest rates and our triple A status is at risk. We are already paying the equivalent of the whole of the education budget on interest payments alone and if we lost our credit rating that would go a whole lot higher and it would cause huge suffering." I then asked her what she thought about the growing inequality between rich and poor and the polarisation of society that this brings. I also asked if she thought the effective working of the economy is really dependant on the huge salaries many in senior positions now think they deserve. Her answer was "it may not be nice but most people are reasonably selfish and look after themselves and their close families and are to some extent greedy and if people cannot earn the big money here, they will simply move to where they can – Switzerland at the moment." Strong redistributive taxation she saw as a great mistake. It is more important she thinks to stimulate growth for "if the economy grows, everyone is better off, including the government which can then afford to spend more on public services." She spoke of the Laffer Curve and argued that higher taxes for the rich now would be counter- productive in the amount of tax it would raise. More important she thought was the need to structure the benefit system so it is worth single mothers and others on benefit returning to work. She thinks that at present for too many going back to work leaves them worse off. We also discussed education and she spoke a lot about how impossible it is to put a price on community and how vital it is to nurture it, particularly by supporting small schools. Her ideas on how to clean up Parliament consisted in backing her leader's suggestions but nothing more radical than that. She was also reassuringly rude about the American right and did not see Sarah Palin as a potential role model. Our interview had gone on well beyond the planned hour when we brought it to a close. How then shall I summarise. Annunziata is bright, highly articulate and self-confident – essential for anyone who is entering the bear pit of politics and where it is difficult not to sound opinionated. She came across as unpretentious, direct and straight forward, with a sharp sense of humour and was relaxed when dealing with an interviewer she knew is not of her party. Her experience as a financial journalist, while impressive is a long way from the world of "ordinary people" though she has clearly been doing a lot of slogging around Somerset campaigning, learning and listening. Her social attitudes come across as compassionate and possibly liberal, but her economic thinking it seems reflect the company she has been keeping - which may favour those with big houses. If you have comments to make please go to Contribute and fill them in on a template asap.